Looks like we'll be at home tomorrow. Food Lion has clementines $5/crate this week, so we may toss our peels in a pot for homemade simmering scents while we're working. such beautiful snow. wow. i wish we'd have some. Maybe with all the weather patterns moving around we'll get some. thanks for sharing your fun. Hmmm...maybe you're in my neck of the woods. Middle Tennessee had it's first snow tonight as well. Just having moved here in April from CA I am **wigging** out a bit. Got the call from the principal tonight, no school tomorrow!! Enjoy your blog, thanks for blessing me. Burrr - Elise looks cold without hat or pants! I guess you don't get enough snow in Tennessee to invest in snow clothes! Enjoy the day in! I do buy snow clothes; we were on our way home from a Christmas program. 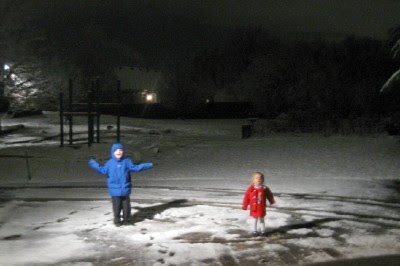 How could I resist letting them slip outside in the dark snow for a few minutes? This year we had a dust of sleet and snow BEFORE you. We got our small amount of snow on Tuesday. Now it did not stay on the ground long. Monday it was 81 degrees. Then the bottom fell out and we go sleet mixed with a bit of snow. I look forward to cooler weather. and in the Joy of Cooking cookbook if you have that. It looks like the kids were having fun, and who couldn't stop and let them out for a few minutes when they're excitedely squealing about the fresh snow?! Living further north, it AMAZES me that school is cancelled in Tennessee for a tiny bit of snow, but, hey, who would argue with a day off? You are a good mom, Meredith. The things you do with your three little ones rememind me of when I was a younger mom. I have felt pretty overwhelmed with five kids these past two years, and posts like this remind me not to forget to do the fun, memory-making things. Nashville often gets snow and we miss it here in Knoxville. After the plateau it jumps over us and into the mountains. My daughter got more snow in New Orleans than we did this time. The kids look like they are having fun. They probably didn't even feel the cold for the excitement. Oh, to think like a child again. Hope you had a great day with them. All your activities sound like fun. My kids loved to make paper and pipe cleaner snowflakes. We would hang them from the ceiling of the porch. It looked like a snowstorm. Sounds like a great day for the kids! Maybe where you live is a bit like Western Oregon where I grew up--snow is a regular winter occurence but not frequent enough for municipalities to invest in enough snow removal equipment to clear all the roads right after a storm. My step-dad grew in in Central/Eastern Ore where snow plows are de riguer and he would laugh & laugh when Western Oregon schools were closed for 2" of snow! We have the first snowfall today, which is unusual for Central WA. Hope you all had a great snow day! How I wish our driveway looked like that! I bet they had tons of fun.